Leaves skin nourished and moisturized. 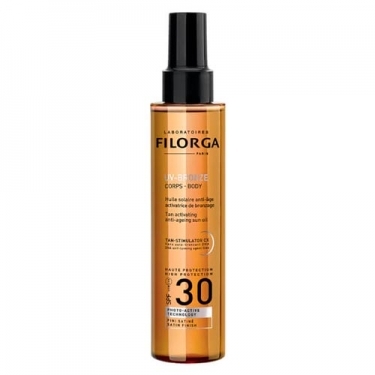 DESCRIPTION: UV Bronze SPF30 Body Oil from Filorga is an anti-aging suntan oil that protects the skin and speeds up the tanning process in complete safety. Enriched with UV filters and a Global Anti-Aging Shield (a powerful antioxidant that is activated by the sun's rays), this oil provides high protection, while Hyaluronic Acid surrounds the skin leaving it nourished, moisturized and intensely toned. It has also infused the formula Tan Stimulator Complex, a melanin booster that speeds the natural tan to a luminous complexion. 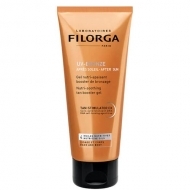 To ensure that hair is silky, apply on hair length during sun exposure.